The fourth episode in the second series of The Borgias is centred around the engagement known as the Battle of Fornovo which occurred on July 6 1495, an altogether bewildering skirmish between the French and the newly minted Holy League. We also see tragedy befall Cesare, who openly reveals his darkening nature and assembles a band of rogues to seek vengeance on the French. Those familiar with Renaissance history may be pleased to note the appearance of Francesco II Gonzaga and Ludovico Sforza. The episode also holds some amusing challenges for fans of art, with glimpses of famous regal portraits by Titian and Clouet featuring the likeness of an actor in the show. Francesco II Gonzaga and Ludovico Sforza ride to Rome, where they meet Alexander and vouch their support for the Holy League. There is a great deal of tension in these scenes between Cesare and the Sforza, which was a nice touch. Cesare has been given an increasing number of reasons to hate the Sforza, starting with Giovanni's Sforza's disrespect to his mother in season one, then his mistreatment of Lucrezia. 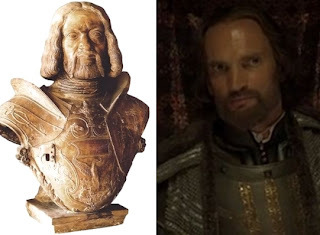 In last week's episode Giovanni rode with Charles VIII to march on Rome and this week we learn of Gioavnni's role in the demise of Ursula Bonadeo. Given this background, Cesare's growing ire with the Sforza is understandable, and will undoubtedly be mirrored in depictions of historical events we expect to see later. The negotiations that led to the formation of the Holy League were of course much more complex - but perhaps best avoided by any historical dramatist interested in moving the story along. Through official documents, diaries and letters we get a fuller picture of the machinations behind the league. ...the vagaries of Christian politics were raising questions in Istanbul, where it was only too clear that the Venetian league had entirely frustrated Charles VIII's alleged intention of using Naples as his point of departure for a crusade. The secretary of the Venetian embassy at the Porte informed his government by letters dated 12 May (1495) that the pashas had been asking him how it had come about (come va queste cosse?) that Lodovico il Moro had invited King Charles into Italy and now joined the league against him....Their purpose [in asking the question] was obviously to illustrate the unreliability of the Christian states, even in dealing with one another. It was interesting to see Francesco and Ludovico, each also important patrons of Renaissance artists and poets. Ludovico was Leonardo's primary patron at this time and the court of Francesco II and his wife Isabella d'Este favoured many notable artists of the day, including Andrea Mantegna. It was this distraction that proved calamitous, as the Italian soldiers and their mercenary allies broke into disorder after descending on the baggage train. Loaded with plunder, they lost their taste for battle and went into a disorganised retreat, with the French giving chase, though they stopped short of pursuing the Italians across the river. It is at this point where the subjective nature of judging the victors in a battle becomes more evident, as each side claimed a victory. Initial reports back to Venice even (falsely) claimed the capture of Charles VIII. Both had suffered casualties, the French a reported 1200, the league around 2000 men. The French had lost their treasure, yet their army and King were still intact. 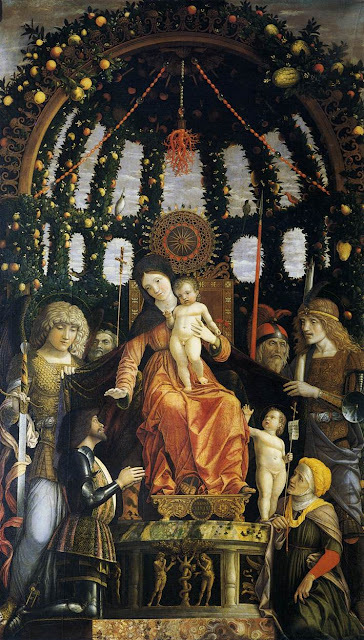 In any event, Francesco saw the proceedings at Fornovo to be sufficiently in his favour to have Mantegna immortalise him in the famous Our Lady of Victory, now at the Louvre. The writers seem intent to give us a traumatic backstory for both Lucrezia and Cesare - presumably with the hope that it may explain some less restrained behaviour as their characters develop. In this episode, the emotional focus in on Cesare - who becomes obsessed with vengeance, having lost Ursula Bonadeo in the sacking of convent of Saint Cecilia by French scouts. After finding Ursula's mutilated body at the convent, Cesare plainly states vengeance is the only emotion left in him now. Seeking revenge against the French, he becomes the ringleader of a group of rogues mustered by Micheletto. Later, after a gruesome session of torturing the captured French scouts, Cesare learns that the convent was deliberately targeted due to his affiliation with it, on the suggestion of Giovanni Sforza. Another intriguing aspect of Cesare being depicted as the leader of the rogues is his insistence on wearing masks. Although this ploy does not successfully hide his own identity (his deeds are known to Alexander by the end of the episode), it may be relevant to revealing the identity of the mysterious masked figure that was said to have a role in the death of Juan Borgia. It is said that at one occasion Lucretia sent for Costa and explained the order of the Pope and a pending case. Costa considered the case as being without importance and said to Lucretia that when the Pope brought up these affairs before the consistory there was the Vice-chancellor or another cardinal who kept the record for him. It would be proper therefore if there were some one present who would note down the conversation. Lucretia answered: “I understand quite well how to write!” Costa asked: “Where is your pen?” Lucretia understood the meaning and joke of the cardinal. She smiled and they brought the conversation to an end in good humor. I was not consulted about these matters. No Raphael portrait sightings to excitedly report this week, though I did catch at least two distortions of famous portraits that had been made to look like the actor playing Francesco II Gonzaga. 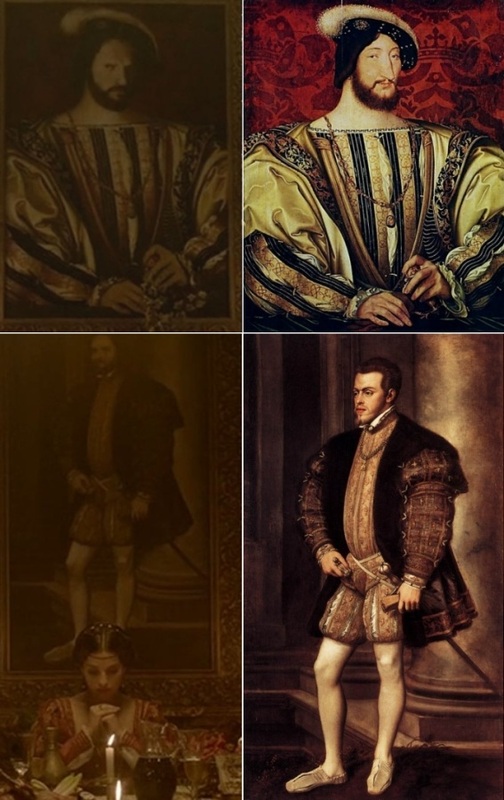 One of these is derived from the Portrait of King Francis I of France by Jean Clouet, the other a Titian portrait of King Phillip II of Spain. Both were painted many years after the era depicted in the show. Bizarrely anachronous, but fun to spot. With Charles VIII and the French forces now much less of a menace, the show will likely shift its focus to the spiteful ambitions of Cesare and Giuliano della Rovere, the latter of which is destined for Florence and a meeting with Savonarola. Thanks so much for these reviews! I just love catching up on the show and then immediately coming to read these reviews. I appreciate how the historical clarifications are presented wthout the snobbishness you sometimes see when "the show gets it wrong". The art glimpses are fun - how funny that they painted O'Kanes into Titian and Clouet - I wonder if he gets to keep them?! thanks for your hard work H! Cheers for the feedback Stephanie.